Images of black cats and creepy kids get an eerie boost from LED eyes. 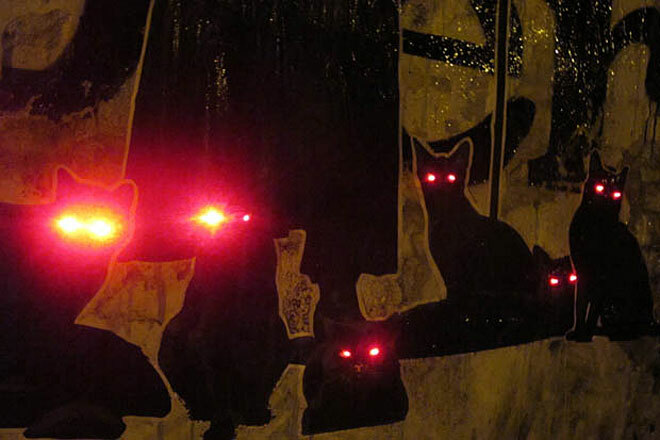 Art collective Ojo Señor is daubing the darkened corners of Barcelona with street artworks that feature cats and children with menacing LED eyes. The posters feature 10 mm color LEDs — in either red, blue or white — which are powered by 3-volt batteries placed behind the paper. Soon after, they thought about the chilling children from the film Village of the Damned, whose eyes glow every time they use their special power to control people’s minds. “We found the idea of little kids controlling your mind in the middle of the night very powerful, so we took that idea for our first series of posters and that became our signature,” they said. Check out Wired UK’s eerie gallery of photos, and follow the collective’s work on their blog. Olivia Solon is a journalist, blogger and geek with a penchant for animal-themed T-shirts. Associate Editor of Wired.co.uk. Tech, science, media, culture and zoo-borns.